The Waiting I (Right) - Klimt tapestry we see the sumptuous work of Gustav Klimt. Here we see the work based on one of the friezes used to decorate Stoclet House, a mansion built by a Brussels banker. Here we see a lady in waiting created by an almost abstract construct of shapes. The figure is created by a building of these triangular blocks which are decorated by geometric shapes and lines. Gorgeous golds, browns, greens, and violets as well as the beige are used to create a scene that shows the hallmarks of the works of Klimt. 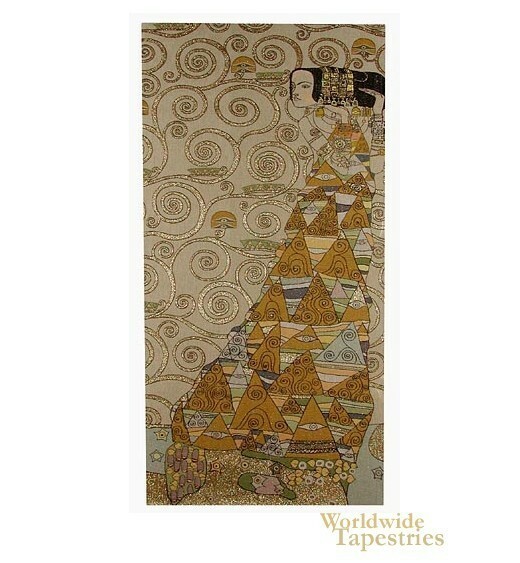 The Waiting I (Right) - Klimt tapestry is backed with lining and tunnel for easy hanging. Dimensions: W 58" x H 118" W 28" x H 58" W 18" x H 38"